Peace lily, or Spathiphyllum, is a common and easy-to-grow houseplant. They are not true lilies but in the Arum family and native to tropical Central and South America. In the wild, peace lilies are understory plants that grow in moisture rich humus and in partially shaded light. Heat, water levels, lighting and disease are potential causes for drooping peace lily plants. Once you discover the cause, it is generally easy to revive a wilting peace lily. But first you need to put your Sherlock Holmes hat on and investigate the reason a peace lily keeps wilting. Peace lily is an attractive foliage plant that produces a flower-like spathe, which is a modified leaf that encloses the real flower, a spadix. While these plants are known for their ease of care, occasional issues may arise. One of the most common is droopy leaves on peace lily. Wilting peace lilies can occur due to several conditions. It is important to look for pest and disease issues, but the problem could also be cultural. Spathiphyllum are Aroids, which means they are known for their glossy foliage and characteristic spathe. Peace lilies grow naturally in tropical rainforests. These plants need water but once per week is usually enough. Water until the moisture comes out the drainage holes in the plant’s container. This will ensure that the root ball is getting moisture. When you repot the plant, separate the roots of the ball out into the new soil so they can gather moisture. One common mistake is to water into a saucer and let the moisture percolate up into the roots. This is time consuming for the plant and it may not be getting adequate moisture. Additionally, the standing water in the saucer may induce root rot and attract insect pests. Good watering practices can quickly revive a wilting peace lily. Correct cultural care needs to be given to peace lily plants. Consistently wilting peace lilies are often the result of simple cultural issues that are easily corrected. Place plants in indirect but bright sunlight. Keep them in a container that is twice as large as the root ball. Wild peace lilies live in warm, tropical regions and require temperatures of 65 to 75 degrees Fahrenheit (18-23 C.) during the day and about 10 degrees cooler at night. Most thrive in average indoor temperatures but exposure to extreme heat or cold can cause drooping peace lily plants. Move any plants that are near the furnace or a drafty window or door. Good, well-draining soil is essential. Soil with a high amount of clay can create unfavorably boggy conditions and those with too much grit or sand will simply drain away the moisture added before the plant can uptake it. The best potting soil for a peace lily is a fine, porous mixture containing peat moss, fine bark, or perlite. When water levels and other cultural issues have been adequately addressed and the plant is still stressed, look for signs of pests or disease. 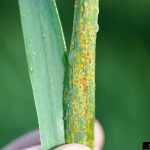 Mealybugs are the most common pest problem. They can be seen as cottony bits of fluff adhering to the plant or in the soil. Their feeding behavior on plant sap reduces plant vigor and disrupts the flow of nutrients and moisture to foliage, causing discoloration and wilting. Sharp sprays of water to rinse off the insects or the application of alcohol directly to the pests can correct an infestation. Cylindrocladium root rot is the most prevalent disease of Spathiphyllum. It occurs in the warm summer months and causes chlorotic areas and wilted leaves. Remove the plant from soil and treat the roots with fungicide. Then repot in a sterile pot with clean soil. Several other pathogens may be harbored in contaminated potting soil. These are generally fungal and may be addressed in a similar manner as Cylindrocladium. Read more articles about Peace Lilies.